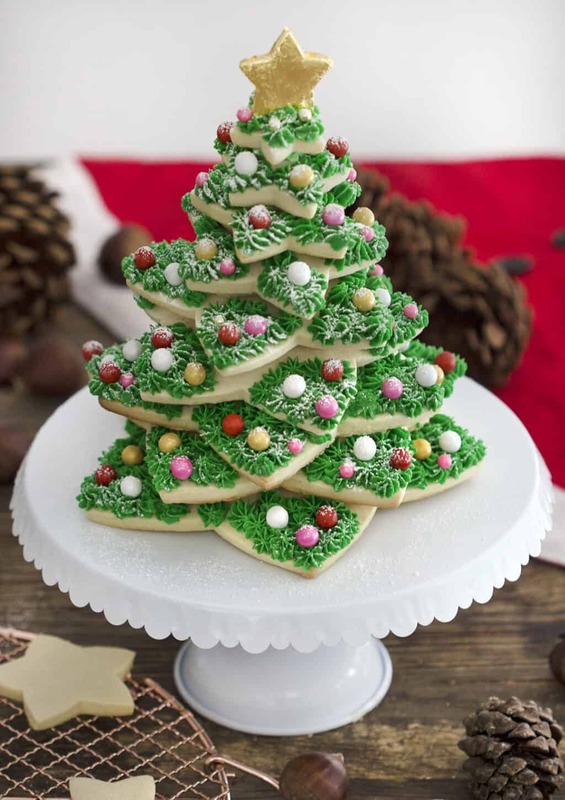 This is the most Christmas sugar cookie arrangement ever! 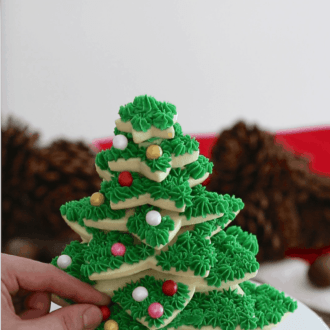 Super easy to assemble and decorate unlike gingerbread houses! I whipped up a batch of green buttercream for my tree the day before, chilled it and let it come to room temperature the next day. When you’re trying to get an especially vivid color with buttercream, make it ahead and you’ll see the color come through. I happened to find some candy coated chocolate balls at my local cake decorating supply shop and they were perfect for ornaments! I finished off the tree with a sprinkling of powdered sugar and a golden star! I love breaking out the edible gold leaf, yes it’s expensive but you end up using it in moderation and it makes such an impact. To make my golden star I painted on a thin layer or sugar glaze and the gold stuck right on! As you can see in the video I cut double the needed stars to give my tree some height. Pipe buttercream to attach each layer using a small closed star tip. A decadent treat made from sugar cookies and buttercream! On low, mix in flour, cornstarch and salt. Roll out between two pieces of parchment paper. Roll to a ½ inch thickness. 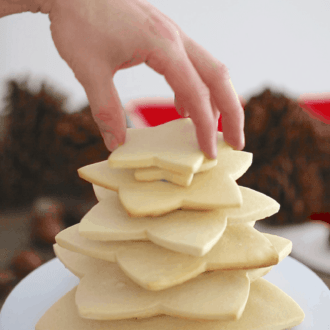 With a cookie cutter, cut out star shapes. Place stars on a baking sheet lined with parchment paper. 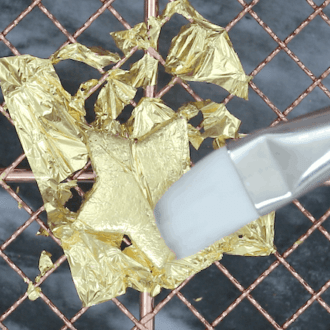 Transfer to a piping bag fitted with a size 30 star tip. Use the buttercream as glue between each layer. 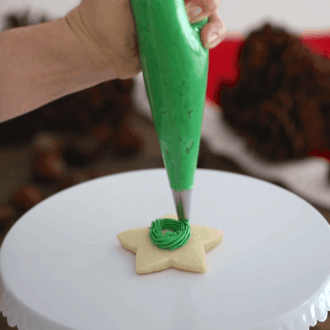 Start by piping buttercream to the bottom of a medium sized star. Place star in the middle of a cake stand and press. Alternate sizes between small and large stars to create a layered look to ascends into a tree. Save a small star for the tree topper. 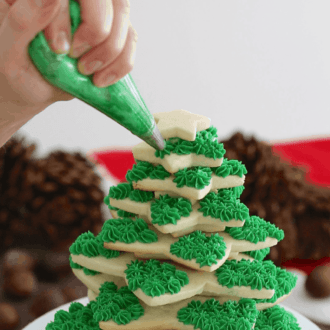 Once you’re finished stacking, pipe buttercream onto each branch. Add ornament decorations. I used christmas color chocolate balls to decorate with. Mix milk and powdered sugar together to create a glaze. Paint the glaze onto the cookie using a paintbrush. Place a sheet of gold leaf over the the cookie. Flatten with brush and smooth out. Pipe buttercream to the top star. Place gold star as the tree topper. The dough only needs to be chilled for about 20-30 minutes. Just until it's firm enough to cut and handle without marring the edges. 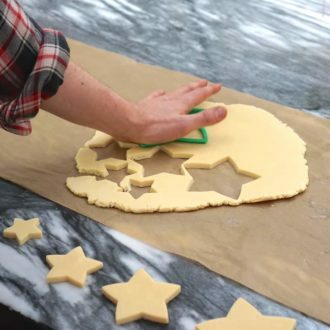 The different sized stars will bake for different times so bake the large sones on separate cookie sheets so they can come out later. Hi i would like to ask you what kind of vanilla ( Powder or Extract) ? I used vanilla extract! 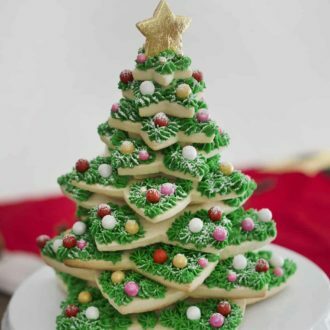 Let me know how your cookie tree turns out! Hi John! Stumbled onto your website and have been watching/reading for hours! I have to say I absolutely love the gracious hospitality concept to my very core. Some of my fondest memories in life involve gathering around a table sharing a meal. Anyway, were the cutters used to make the tree a set? If so, would you mind sharing where you put them? Thanks in advance for your response. I know it’s only Aug. However, I’m a planner!! 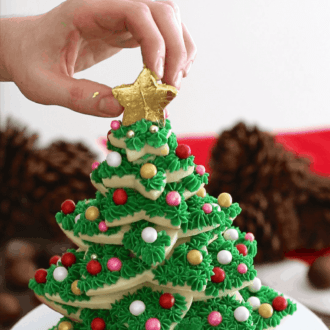 We have a huge Christmas dinner party ever year and I’m planning to make 3 of your desserts!!! I purchased the set on amazon! Here is the link. Hope you enjoy! Thanks I have the cutters from Avon but no directions on assembly. Your recipes look great have printed some and will be baking this weekend. Have a great holiday.